«©NCSX» Vaan's pendant in the Final Fantasy XII game is fairly large. The official Square Enix recreation of the pendant is fairly small. 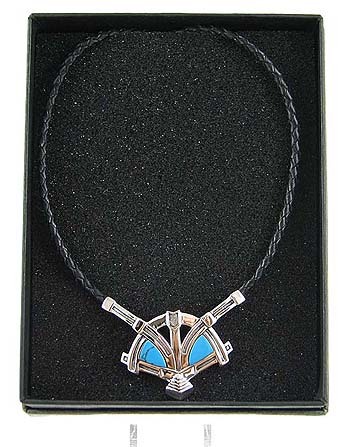 Then again, if the product was made the scale, it would probably cost twice as much as its current price level The pendant is constructed of sterling silver and two pieces of turquoise which are fitted inside the silver. 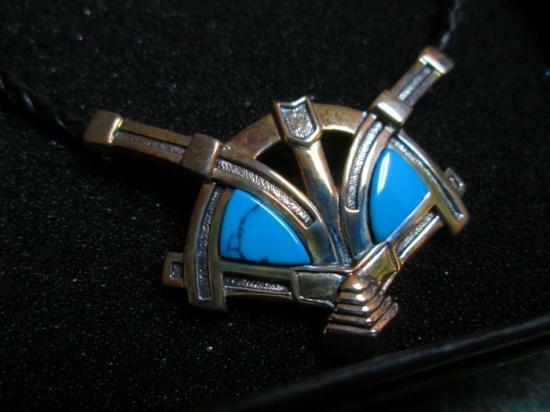 If NCS had to make an approximation of what the pendant most looks like, we'd have to say that it looks like the countenance of a bumble bee or some other winged insect. The receptacles that connect to the leather necklace can be considered the insect's antennae. The measurements of the pendant are 35 x 42 x 3.8mm and the leather necklace measures 45cm. This document is ©NCSX 2006, 2009. All rights reserved. No reproduction in whole or in part of this document may be made without express written consent of National Console Support, Inc.